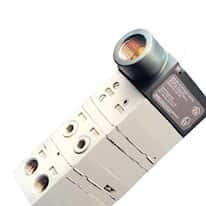 Pressure transducers convert an applied pressure through a process connection into a current or voltage output. Traditionally, pressure transmitters have a current (4 to 20 mA) output, while pressure transducers have a voltage output, but the terminology is interchangeable when talking about pressure instruments. All pressure transmitters and pressure transducers are used for their output to control pumps, switches, PLCs, or just send a signal to a panel meter to control processes or signal a need for attention. We have sanitary, industrial, differential, and barometric pressure transducers to meet your needs.